This is what I look like! Mystery solved! Part one of my business trip was a roaring success! I was invited to sit on two panels about writing steampunk (I explained that I sort of don't, but they insisted), did a bit of networking with other authors, and of course had all the non-writing-related fun the convention had to offer. Part two of my trip will be selling books at the Tucson Festival of Books on Sunday, March 13th. I’ll be at the teen/children author’s pavilion* from 12:15 to 2:15. Please come and say hello. If you buy a book, I’ll sign it! 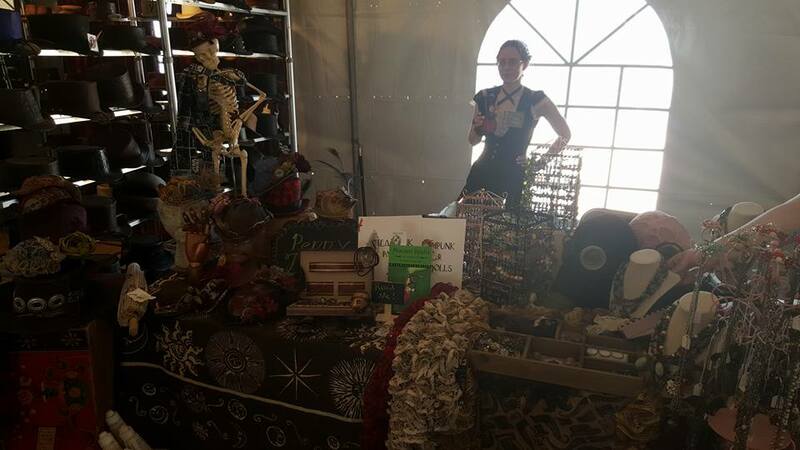 My sister's merchandise: hats, parasols, metal claws, cuff links, bolo ties, etc. Becky's merchandise: scarves, earrings, necklaces, beaded spiders, fancy gas masks, etc. A desperado sister ready for tea dueling! It was very dusty there. I had to keep my extra books in zip-lock gallon bags to keep them clean. Convention stuff: program and badge, two bracelets I bought from Becky, tea I bought from a vendor. My sister's cat decided that she would pose oddly for the picture. Life is Busy! Please Stand By!